For some retirees, figuring out what to do with all of their free time can be challenging. We spend our whole lives working and waking up each day with a purpose and it can be difficult to get accustomed to a new way of living. However, many older adults learn that retirement isn’t so bad once they realize they finally have time to do the things they have been putting off for years. 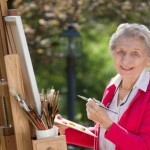 Below, we have compiled a list of 50 hobbies for adults 65+.